I like that flashbacks continue to be rendered in black, white, and red. The first one we see in the issue is Falcon and Captain America after an un-named catastrophe, with an EMT telling Falcon he needs to get some rest. Cap insists that he does, saying that there are other Avengers to help. Falcon is getting discouraged that the evil in the world never stops, and he wants to have a world that he can feel is safe for his family and, someday, his own wife and children. That’s why he never wants to slow down or stop fighting. In present day, Sam finds himself in India, heartbroken by what he sees in the slums and disappointed in himself, asking, “What good are you, ‘super hero?’ Who do you really serve?” The same doubts he was having in the past are still present, haunting him. HYDRA has hid the bioweapon here, and Armadillo is guarding it. Cap fights with him for a bit, trying to talk him down, but Cobra shows up too, tackling him from behind. Armadillo says, “None of you ever help me. No matter what you promise. HYDRA’s givin’ me the thing you ‘heroes’ never did – they’re making me human again.” For those who don’t know, like me, Armadillo is Antonio Rodriguez, who bonded with his big rock suit in order to save his dying wife. I think it’s interesting that he became a super villain not for power, but to save someone. Meanwhile, Zemo checks in with Viper to see about the bomb, but Misty interrupts. Cap finally gets through to Armadillo, who helps him fight off Cobra, and Cap promises that they’ll help him when all this is over. Armadillo is pretty skeptical, but he agrees to destroy the cropduster filled with blood that he’s guarding AND gives the locations of the other bioweapon sites: Madripoor (where Viper and Misty are), Antarctica, Moscow, and Florida (a rocket filled with blood-gorged fleas). Unfortunately, everything is set to go off at the same time. Not sure why Antarctica was picked as a site if the goal is to sterilize the population. Maybe we’ll find out. We cut to Cap and Misty meeting up, where she assures him that she handled the Viper problem in Madripoor. 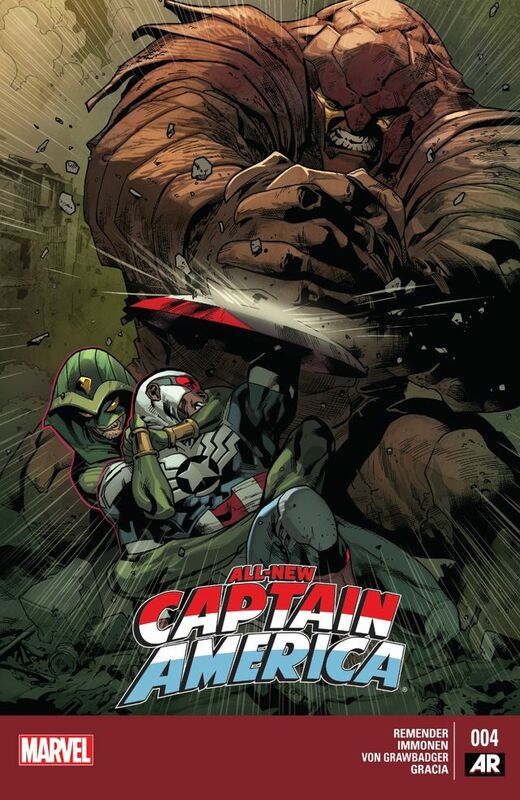 Cap is off to Florida (and Zemo, and revenge), and tells Misty to tackle Moscow. I guess they don’t care about Antarctica either. The issue ends on an awful cliffhanger, and I can’t wait to see what happens next.